Overcoming your fear of utilizing your creativity. One of the advantages of being a travelling musician is getting to listen to audio books and podcasts on the way to various gigs. Two recent highlights have been Elizabeth Gilbert’s wonderful resource book about creativity called Big Magic and her follow-up podcast Magic Lessons. “Without (creativity) I am not OK and without having access to everyone else’s, we are not OK.
My friend Drake Powe is someone I think of whose living presence is an expression of creativity. Drake was the best man at my wedding. Each interaction I have with him, brings me fully into the present and shifts me back to what is vital in this moment. Even before he had an outlet for his creativity, Drake’s canvas was interaction. Drake is a big persona. He is not only larger than life in personality but also in stature. You might be surprised that despite being over six feet tall with a barrel chest that houses his immense heart, Drake has wrestled with a fear of being attacked. This might stem from growing up in a rough neighborhood, however, fear of being vulnerable extends to being criticized as well. Anyone with a presence on line, risks being attacked by mean spirited individuals with a lot of time on their hands. Both Elizabeth Gilbert and Brene Brown talk of having to deal with trolls who antagonize them for being powerful women who choose to demonstrate their creativity in an empowering way. Drake has pushed past his fears and the stress of being an empowering black man in his community. 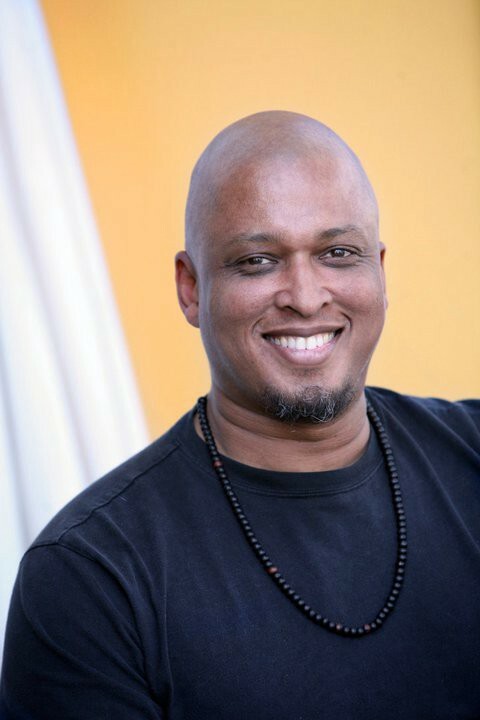 As a yoga instructor, he has felt comfortable dealing with individuals and small groups but recently he has challenged himself to begin speaking in public. In one of these presentations, he talks of accessing his inner superhero whose power is being calm and optimistic in stressful situations. He has managed to reframe his story, (fears of attack) by applying this superpower. He has recognized that very thing that stresses him out, simultaneously has the power of fueling his gift. When I think of what super power I want to have, it is the ability to step outside of time, to be able to experience and bestow a state of timelessness. What pushes my buttons and causes me stress are, most often, fear based time-related issues, such as deadlines and ‘to do’ lists, even if they are self-imposed. When I react from a time-stressed center, my frame becomes small and, as my wife would say, “I am not my best self.” I have experienced that my creativity is heightened when I activate my superpower. Timelessness brings me back to benevolence. Benevolence extends the frame of my being beyond space. The music that flows from that, reduces stress and dances without constraint. I wonder if each of us has a superpower that is restrained by stress, fear, or not fully utilizing our creativity. Just for this moment, allow yourself to step out of time, reframe. Go beyond the self you know. There really is no frame to what we actually are. Being able to sit within our natural state of being gives us access to our creativity, our ability to be Faster than a speeding negative thought- More powerful than criticism -Able to leap stress at a single bound! Originally published at www.streamoflightblog.com on March 15, 2017.